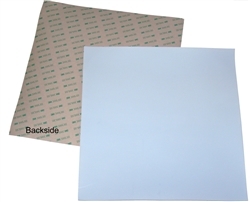 SULOFRI-SHEET-3M-12x12 is a sheet of the exact same material we use for our SULOFRI super-low friction soles, for dancing outdoors on concrete and asphalt. The sheet is of Size 12 in x 12 in (305 mm x 305 mm) with a thickness of 0.03". SULOFRI-SHEET-3M can be cut with household scissors or utility knives. We cut our SULOFRI soles products from these exact same sheets and we can squeeze about six sets of SULOFRI soles from one SULOFRI-SHEET-3M-12x12. 2. smaller sheets of Size 8" x 12" Item Number SULOFRI-SHEET-3M-08x12. Applied this to my leather bottom dance shoes. Went to two outdoor Italian festivals and danced on street pavement. I was able to do spins and pivots like I was on a wood, indoor floor! The material took a beating but it's still intact. These soles protect my shoes from being torn up by cement. Brick, and asphalt at outdoor venues.